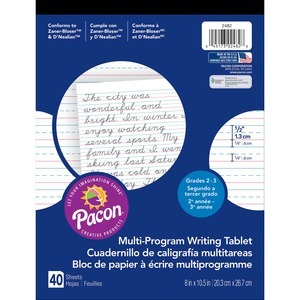 Multi-program handwriting tablet features a 1/2" ruling with a dotted midline to help young students learn to write properly within the lines. Heavy chipboard back provides a sturdy surface for legible handwriting. Front cover protects the pages from random marks and damage. Handwriting tablet conforms to both the Zaner-Bloser (grade two) and D'Nealian (grade two and three) handwriting programs.